When it came to choosing a title for their debut album, the members of Kaleidoscope didn't have to search too far for inspiration. The band's vocalist Kylie Cowling was inspiration enough. Titled Deli Girl, the album pays homage to Cowling's day-time career - and the band felt it could not be any more fitting. 'Kylie works in a gourmet deli and we have the song Deli Girl as well, so it seems to be a pretty apt title considering what she did and where we live,' guitarist Craig Lewis said. The album's cover features a photograph of meats and cheeses and was photographed at Cowling's delicatessen. The band formed more than six years ago but have only released two EPs. 'The reason it took so long was because we wanted to make sure it was the absolute best that we could possibly do,' Lewis said. Another change came this year when drummer Steven Shier left the band and was replaced by Jason Ayres-White. 'Steve just couldn't see where we were going and lost the inspiration for what we wanted to do and he didn't really want to tour, so that made it hard for us,' Lewis said. 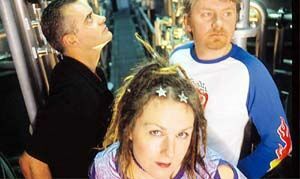 Kaleidoscope will return to Newcastle for the first time since November 2000 to perform at Newcastle University today. On Saturday night, they will return to The Cambridge Hotel.